The city of Nawabs, the city of tehzeeb and the most important place of Indian politics, Lucknow city is now on a transformation these days. Coming out from the old trends and shackles, the city has now applied the new culture and advancement and modernization is now clearly visible here. Lucknow city is famous for its boutiques, khadi and other designer clothing material businesses. Several types of trade businesses and import-export are also the major sources of the economy here. But the main reason behind its massive jump in the economy is the developing IT sector. In the recent few decades, many multinational companies have acquired here commercial spaces to set up their offices and their huge investments have brought here an industrial revolution. Now, with the commercial growth, the real estate market also get here the hype as buyers and investors from all over the nation have started showing interests here in the properties. If you are also planning about to invest here, this is the right time for it because of the coming years to going to be very special in terms of great value appreciation. 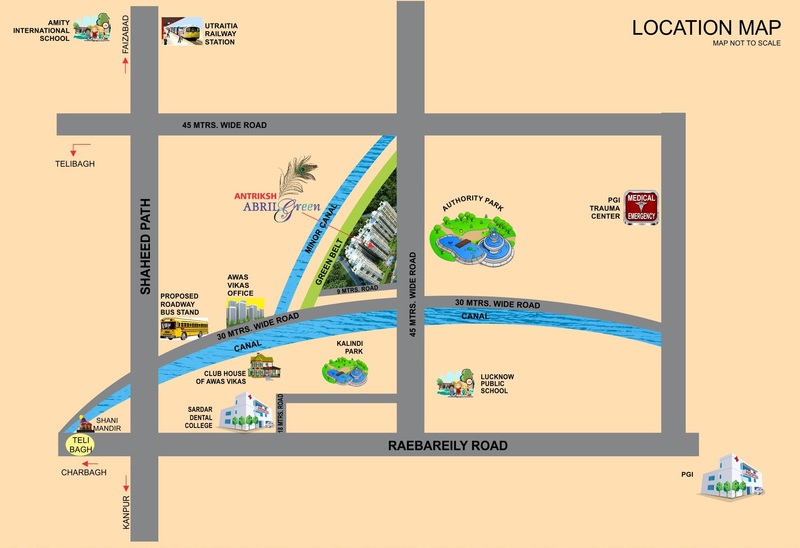 Homebuyers in Lucknow are now showing interests towards a uniquely designed residential property, Antriksh Abril Green. This project has astonishing exteriors which provide a royal-type look and experience to the residents. Buyers can select from the 2 and 3 BHK apartments in Antriksh Abril Green Lucknow which have whopping sizes varying from 1000 sq. ft. to 1535 sq. ft. There are split AC units into selected areas in these apartments and the quality of interiors here is excellent and provide a unique charm and glow to their users. An advantageous geographical location is an additional benefit for the residents of Antriksh Abril Green Vrindavan Yojna as they can move around seamlessly from here to all the important landmarks in the city. It is well-connected to the airport, major railway stations and important IT hubs in the city. The complex comes with a supreme range of modern facilities and lifestyle amenities which include a restaurant, video security, intercom, meditation centre, indoor and outdoor games, swimming pool, clubhouse, car parking, power backup and much more. Avail the exciting offers available here on the new bookings and the Antriksh Abril Green price ranging from INR 33.99 lakhs to INR 52.17 lakhs.